Amin Jaafari is on a roll. An Arab living in Israel, Amin is a prominent physician who has received a prestigious Israeli award, the first Arab ever to do so. Self-satisfied and apparently secure in his status, Amin lives in a modern home in Tel Aviv, and despite some annoyances — the occasional sarcasm of a colleague, for example — he seems to have found a niche in which he (and his wife) can find fulfillment: or so he thinks. Those last four words are essential if there’s to be a story, and The Attack, the movie in which Amin is the central figure, has an amazing story to tell, a complex tale that’s less about who’s right when it comes to the Palestinian/Israeli conflict than about what can happen when people are thrown into situations that seem beyond navigation. The Attack revolves around an irreversible shock to Amin’s system. He learns that his wife of 15 years is suspected of having conducted a suicide bombing in which 17 Israelis died, including 11 children. To further sharpen the irony, Amin helped administer medical aid to many of the victims of the bombing, which took place while he was lunching in the cafeteria of the hospital where he works. And, yes, Amin sees the bombing as appalling and senseless. Based on L’Attentat, a novel by Yasmina Khadra, and directed by Lebanese filmmaker Ziad Doueiri, The Attack is one of the best movies I’ve seen about what happens to an assimilated member of a minority who’s forced to look at problems he thought he’d left behind. The movie is also about the astonishing distance that can develop between a husband and a wife. Awakened by a middle-of-the-night phone call, Amin must go to the morgue to identify his wife’s body, which was blown in two by the explosion. Amin’s wife Siham (Reymond Amsalem) may have found a cause she prized more than personal comfort and even love. As played by Ali Suliman — in one of the year’s best performances — Amin is a man searching for a truth he may not want to find; he’s also a man caught in a conflict that not only changes the circumstances of his life but challenges his view of himself. If his wife did commit this heinous act, how could Amin not have seen it coming? Doueiri thoroughly penetrates Amin’s shattered world while also revealing the social and ethnic layers that characterize life in cosmopolitan Tel Aviv and in the West Bank, particularly the city of Nablus. As the story develops, Amin is put through a wringer in which the personal and the political become irrevocably conflated. He’s lost the woman he loves, and also must begin to come to grips with the past he’d thought he’d outgrown when he moved from the territories into an Israeli society that afforded him considerable opportunity. 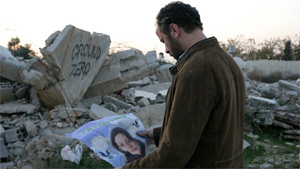 Doueiri, who wrote the screenplay with his wife, Joelle Touma, isn’t interested in playing judge and jury: The story doesn’t punish Amin for his shortcomings, and Amin doesn’t abruptly alter his entire value system to embrace suicide bombings. He also must grieve. In a series of tender flashbacks, Doueiri depicts the deep love that Amin felt for his wife. We see the woman he thought she was — and who, for much of the time, she actually was for him. Contrary to what its blunt title suggests, The Attack takes a nuanced and thoughtful approach to emotionally volatile material. When Amin travels to Nablus to reunite with family members he hasn’t seen for years and to learn more about his late wife, he’s brought to an agonizing point that many face, but few with such unbearable clarity. He must learn to live with the irresolvable contradictions that now will define him. Put another way, Doueiri’s movie asks a deeply disturbing question: What happens when a man fully awakens — only to discover that he’s living in a nightmare?